President Johnson presides Exceptional Service Award ceremony for Agent Youngblood. 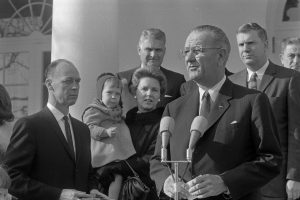 White House Rose Garden, Dec. 4, 1963, WHPO, LBJ Library. 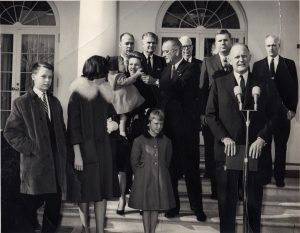 On this day, 55 years ago, on a chilly morning in the White House Rose Garden, US Treasury Secretary Douglas Dillon presented my father with the Exceptional Service Award in the presence of President Johnson, Treasury and Secret Service officials, the press, our family, and others. This Award is made in recognition of Agent Youngblood’s outstanding courage and voluntary risk of personal safety in protecting the Vice President of the United States at the time of President John F. Kennedy’s assassination in Dallas, Texas, on November 22, 1963. 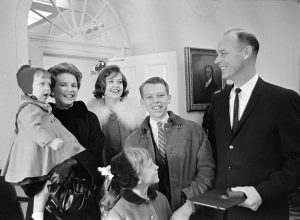 Mr. Youngblood was riding in the front seat of the Vice President’s limousine within close proximity to the President’s limousine when the assassination occurred. Upon hearing the first shot, Mr. Youngblood instantly vaulted across the front seat of the car, pushed the Vice President to the floor, and shielded the Vice President’s body with his own. 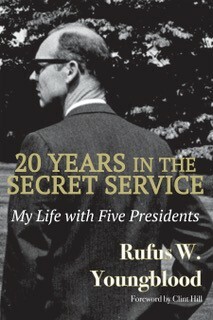 His prompt response in the face of great danger and his readiness to sacrifice his life to save the Vice President was in the highest traditions of the Secret Service. His valor and example make him a worthy recipient of this Award. Award Ceremony, White House Rose Garden, Abbie Rowe, WHPO, RWY Collection. The Bunny (my nickname at the time) liked him. 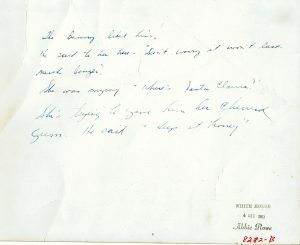 Peggy Youngblood’s notes on the back of the photograph (above) taken by Abbie Rowe, WHPO, LBJ Library. 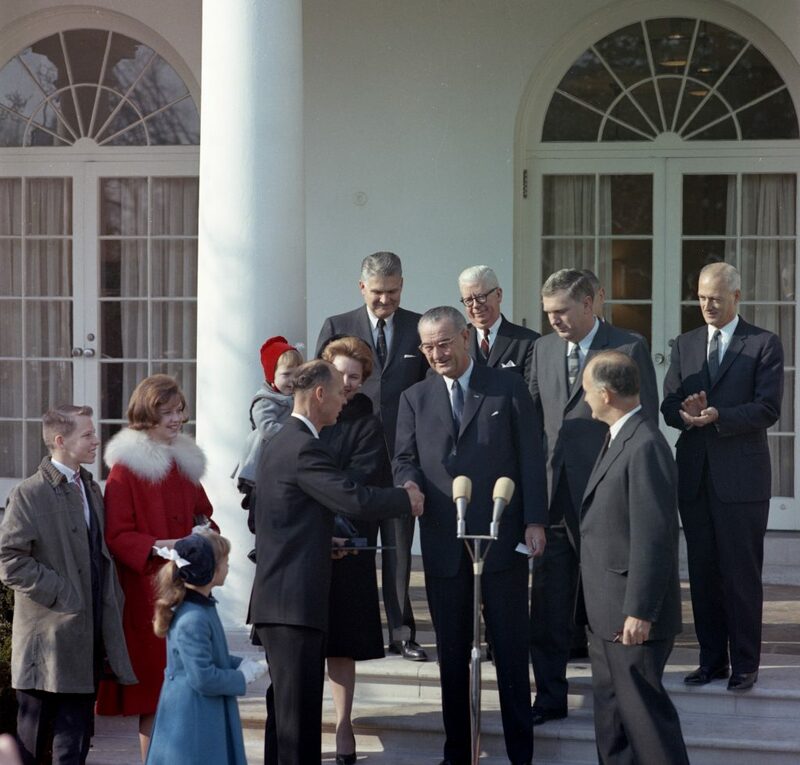 President Johnson praises Agent Youngblood. White House Rose Garden, Dec. 4, 1963. WHPO, LBJ Library. There is no more heroic act than offering your life to save another, and in that awful moment of confusion when all about him were losing their heads, Rufus Youngblood never lost his. Without hesitation, he volunteered his life to save mine. Nothing makes a man feel better than being an American and to be witness to this kind of noble patriotism. Rufus, there is no prouder person here this morning than I. You are a brave soldier in the highest American tradition of love for country and for duty. You are a proud son of Georgia. You are an excellent example of all the honored and brave and dedicated and diligent men and the women who work with them who make up what we proudly call the United States Secret Service. A more dedicated group of men I have never known from the Chief to the most humble employee. I am glad to know that Chief Rowley has made it possible for you to continue to serve the President as you did the Vice President, and I know in so doing that I will have one of the most noble and most able public servants I have ever known. The Youngblood family after the ceremony, L to R: Rebecca, Peggy, Joy, Candy, Mark. The White House Cabinet Room, Dec. 4, 1963, WHPO, LBJ Library. Another wonderful tribute Rebecca. Thank you so very much. I didn’t know about the chewing gum incident, how cute! Thank you, Nancy! I’m surprised he didn’t mention it to you. My mother sure did re-tell this story–often!